Residents in Surrey Docks Ward will be asked to elect a new councillor at a by-election on Thursday 9 June. Lisa Rajan – a Lib Dem councillor since 2002 – has resigned her council seat because her husband now works in Manchester. 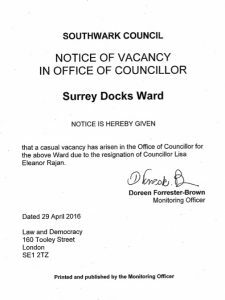 “It is with huge sadness that I am standing down as one of the Liberal Democrat councillors for Surrey Docks,” said Lisa Rajan. “For fourteen years I have had the greatest privilege of representing an incredible community and helping win the fights for the new Canada Water Library and the C10 bus route. 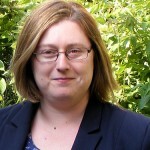 “Being a councillor needs serious commitment though and I’m very sorry that changes in my personal life mean that I can no longer serve residents the way Liberal Democrat councillors believe we should always do. “Fourteen years after first being elected, there are still huge issues in Surrey Docks. Most importantly, we need to make the council’s regeneration process happen ‘with’ residents and not ‘to’ them. We also need proper infrastructure in place – GPs, schools and transport – before further huge development takes place at Canada Water. Lisa Rajan is the author of the ‘Tara Binns’ series of children’s books. Watch Cllr Anood Al-Samerai (Southwark Lib Dem leader) question Cllr Peter John (Labour leader of the council) about the impact of tall buildings at Canada Water and elsewhere in the borough. The video is from the Council Assembly meeting on 16 March. 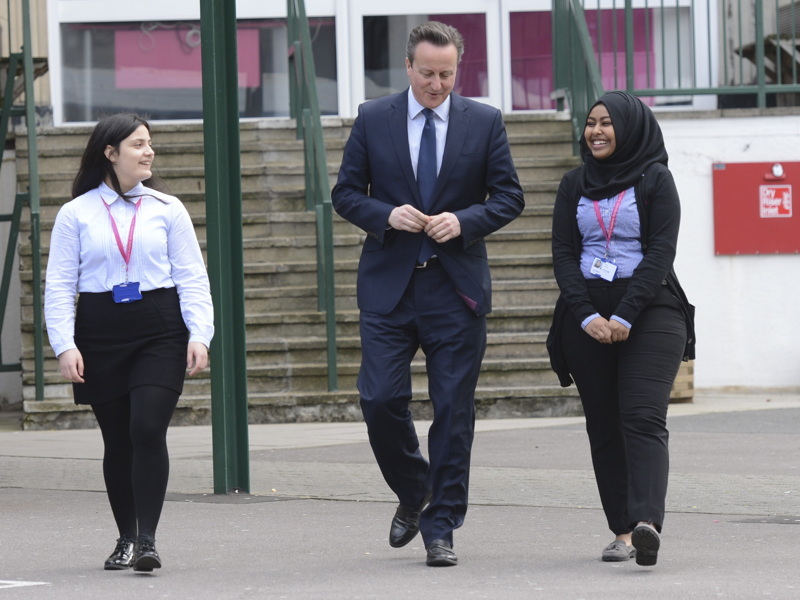 Bermondsey might not be normally be associated with its love of Tory politicians, but prime minister David Cameron certainly received a rapturous response from Harris Academy Bermondsey pupils when he dropped in on Monday morning. If Justin Bieber had visited the Bermondsey girls’ secondary school he would scarcely have caused more of a stir than the prime minister. 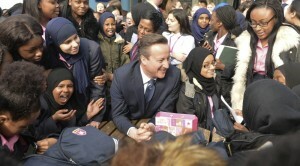 Pupils crowded round Mr Cameron during the mid-morning break and clamoured for autographs and selfies. 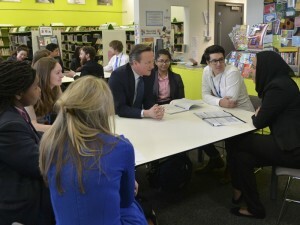 The PM’s visit was to launch a £12 million Government initiative to promote mentoring schemes in secondary schools. Once the scheme is up and running, Downing Street claims that 25,000 young people a year who are at risk of under achieving or dropping out from education will receive extra support from “high-flying professionals”. Harris Academy Bermondsey has run a mentoring scheme for its pupils for a decade. Employees from several Southwark-based firms – including News UK, PwC and the Financial Times – act as mentors to girls preparing for GCSE exams at the Southwark Park Road academy. Harris Academy Bermondsey is part of the Harris Federation of schools founded by the Conservative peer Lord Harris of Peckham. The service will be moved to Fred Francis Day Centre in East Dulwich until the council’s new centre in Cator Street, Peckham, is ready in two years’ time. It’s nearly two years since the last local elections. The Southwark Labour manifesto included a pledge to “bring superfast broadband to the Rotherhithe peninsula” and next week the Borough’s cabinet will receive a progress report. This report provides Cabinet with an update on the work the council is doing to bring superfast broadband to the Rotherhithe peninsula. Crucially a constructive working relationship has been established with BT Openreach, a major provider of broadband infrastructure, who is now offering a combination of solutions to improve broadband coverage in Rotherhithe. BT has committed to the deployment of new green boxes, which bring fibre cables and improved connection speeds and will deliver superfast broadband to an additional 4,000 homes in Southwark, with a particular focus in Rotherhithe, by 31 March 2016. BT and the council are also proposing to run a pilot in a number of council housing blocks in Rotherhithe where BT will install smaller, condensed versions of green boxes in the building. This is new technology and is known as Fibre to the Internal Cabinet (FTTIC). If successful we will look to expand this provision to more estates. A Rotherhithe Broadband working party has been established which includes officers from the Planning and Highways departments as well as Housing & Modernisation. The group will manage liaison with BT Openreach (and potentially other broadband infrastructure providers) and push for speedy and complete deployment of fibre cabling in Rotherhithe and elsewhere in Southwark. Overall good progress is being made in improving broadband services but we are still some distance from the 100% coverage that we are seeking and so our work continues. Transport for London is to draw up a bus network plan for Rotherhithe by the summer of this year, Mayor of London Boris Johnson has said. The population in Rotherhithe is increasing rapidly, with Surrey Docks ward projected to increase by 40% in the next four years alone. What plans do you have to improve bus services for the residents of Rotherhithe to meet the growing transport needs of the area? LB Southwark and TfL officers have held discussions on how best to meet the needs of this expanding area. TfL has agreed to develop a bus network plan for the area for the next few years by summer 2016. This will include necessary infrastructure provision, routeing of services to better serve the retail area and adequate service provision to serve Canada Water Station. As part of the plan, TfL will also consider other large scale developments in the area, including Convoys Wharf and Surrey Canal Road to ensure there is sufficient transport provision within the Rotherhithe area. TfL is aware of the need to monitor existing provision in the area to ensure capacity and reliability for the existing bus services is adequate in the short term. Council assembly recognises that there are significant traffic problems on the Rotherhithe peninsula, with the high demand for river crossings making the Rotherhithe area particularly susceptible to congestion from tunnel related traffic, which is detrimental to the local environment, particularly air quality, and can make local trips difficult. Council assembly further recognises that the significant growth planned in the Canada Water area, including an increase in new homes and job opportunities, will require a significant investment in transport infrastructure. Address in a full and proper manner the concerns and recommendations raised by the council in relation to the proposals for the new Silvertown Tunnel, which will impact negatively on the quality of life of a vast number of people who live and work in the borough. Bermondsey & Old Southwark Labour MP Neil Coyle was one of 120 parliamentarians to put his name to a letter to the Daily Telegraph last Saturday highlighting problems with broadband speeds and calling for the breakup of BT and BT Openreach. Read the letter in full. BT has been fined £2,620 and ordered to pay costs of £3,500 for a number of offences including carrying out roadworks in Jamaica Road without obtaining a permit from Transport for London. News of the fine comes in a report to the TfL board from London transport commissioner Mike Brown. On 20 January 2016, we successfully prosecuted British Telecom (BT) for streetworks offences committed at four separate locations on the TLRN between June and July 2015. The offences are working without a permit in Devonshire Road, Lewisham and Jamaica Road, Southwark; working in breach of permit conditions in Bath Road, Hillingdon and failing to serve a statutory works notice in the course of executing works in Colnbrook Bypass, Hillingdon. BT also failed to pay the Fixed Penalty Notices initially issued by TfL in response to these offences. BT pleaded guilty to all four offences at court and was fined £2,620 and ordered to pay TfL’s costs of £3,500. TfL has prosecuted BT for 28 previous offences since 2010 and issued over 650 Fixed Penalty Notices of which 82 were issued in 2015. The Care Quality Commission (CQC) has rated Dr Shabir Bhatti of the Bermondsey Spa Medical Practice in Old Jamaica Road as inadequate and has placed the practice into special measures following an inspection in October 2015. Placement into special measures means that the provider must now make necessary improvements or face action that could result in closure. The Bermondsey Spa Medical Practice opened in 2011. Before then, it was known as the Parkers Row Family Practice and was based on the Dickens Estate north of Jamaica Road. Under CQC’s programme of inspections, all primary medical services in England are being given a rating according to whether they are safe, effective, caring, responsive and well led. However, some patients were positive about their interactions with staff, although some patients did raise concerns about a lack of concern and rude attitudes from reception and clinical staff on occasions. CQC inspectors found that appropriate recruitment checks for staff had not been undertaken prior to their employment, and that there were insufficient arrangements to safeguard people from abuse. Practice staff were not clear about reporting incidents, near misses and concerns and there was no evidence of learning and communication with staff. When we are faced with a provider that is experiencing difficulties in providing adequate care for patients, our first instinct is to work with them to ensure that patient care improves. We are confident that Dr Shabir Bhatti will take any necessary action to address the concerns we identified during our most recent inspection. In particular, the provider must ensure that significant events are consistently recorded and discussed to share learning, and that appropriate staffing arrangements are put in place in order to improve patient access to appointments, reduce risks and improve patient safety. We will re-inspect within six months to check whether sufficient improvements have been made. If sufficient improvements have not been made and there remains a rating of inadequate for any key question or overall, we will take further action which may include closure.